Synthetic peptide within Human SH3GL2. The exact sequence is proprietary. Mouse brain, rat brain, Human cerebellum and Human fetal brain lysates; Human brain and Human glioma tissue. Our Abpromise guarantee covers the use of ab169762 in the following tested applications. WB 1/1000 - 1/10000. Detects a band of approximately 40 kDa (predicted molecular weight: 40 kDa). Implicated in synaptic vesicle endocytosis. May recruit other proteins to membranes with high curvature. Belongs to the endophilin family. Cytoplasm. Membrane. Concentrated in presynaptic nerve terminals in neurons. Immunohistochemical analysis of paraffin-embedded Human glioma tissue labeling SH3GL2 with ab169762 at 1/250 dilution. Immunohistochemical analysis of paraffin-embedded Human brain tissue labeling SH3GL2 with ab169762 at 1/250 dilution. ab169762 showing +ve staining in Mouse brain tissue. ab169762 showing -ve staining in Human uterus tissue. ab169762 showing -ve staining in Human thyroid gland carcinoma tissue. ab169762 showing -ve staining in Human skeletal muscle tissue. Detection of SH3GL2 by Western Blot of Immunprecipitate. Human fetal brain lysate cell lysate (lane 1) or 1 X PBS negaative control (lane 2) immunoprecipitated using ab169762 at 1/10 dilution. 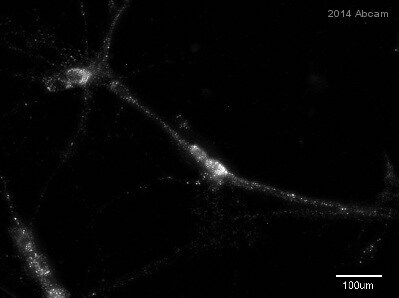 ab169762 staining SH3GL2 in mouse primary hippocampal neurons by ICC/IF (Immunocytochemistry/immunofluorescence). Cells were fixed with 2% paraformaldehyde for 15 minutes at room temperature, permeabilized with 0.05% Triton X-100 + 0.05% Tween20 in PBS and blocked with 1% BSA for 30 minutes at 22°C. Samples were incubated with primary antibody (1/150 in PBS + 1% BSA) for 2 hour at 22°C. An Alexa Fluor® 594-conjugated goat anti-rabbit IgG polyclonal (1/1500) was used as the secondary antibody. Publishing research using ab169762? Please let us know so that we can cite the reference in this datasheet.